One of my favourite things in the world is to find a nice cafe, settle in with a coffee and a bite to eat, and while away a gentle afternoon without a care in the world. I seem to have an abundance of these little cafes around where I live, maybe a subconscious reason why I refuse to move away! The last few months has seen an influx of new independently run places, with No 67 on Peckham road my current favourite. The London Particular is a welcome addition to the relatively bare stretch between New Cross and New Cross Gate stations. Selling "healthy" food in bowls seems like a bit of an odd selling point for a cafe but seems to work as the little place was crammed when I visited. With one big table, and 2 smaller tables (one outside), it reaches capacity pretty quickly but feels cosy and welcoming. 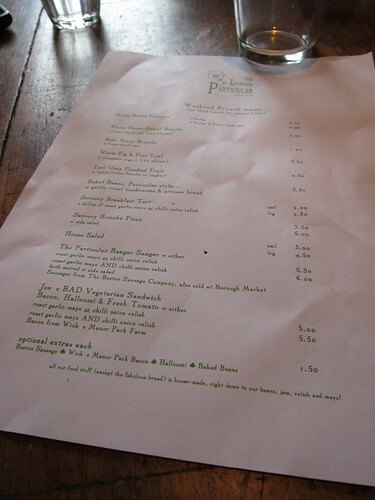 The food itself is pretty simple with sandwiches and salads dominating the menu, with their own blend of "Particular" coffee on the menu. I know that my fellow diners were slightly disappointed that they had run out of their brioche pizza (probably my fault as I was late), but we all opted for the bacon and sausage sandwiches. This is where it all falls apart a little. For a small place, the service was painfully slow. Once we had finally managed to order, we had another excruciating wait before our sandwiches decided to reveal themselves. Although the "Banger Sanger" arrived with a salad comprising of squash, chickpeas and cauliflower, the bacon sandwiches didn't. We had requested that this also came with a side salad, but instead arrived on its own and we were charged an extra £3 for the privilege. "Jon's BAD vegetarian" sandwich was a halloumi and bacon sandwich. 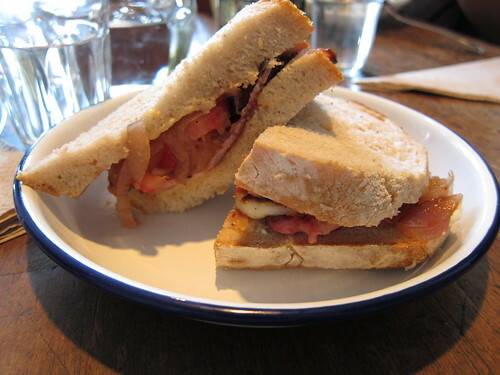 This was a most excellent bacon sandwich between two slices of soft, bouncy and flavourful white bread. 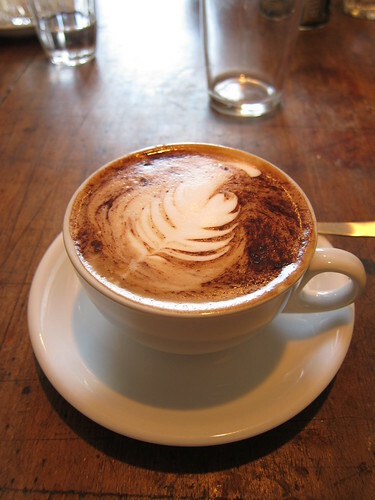 Alongside a well made cappuccino, I took a few moments to myself as I slowly savoured each bite, and just for a little while, all this little cafes shortcomings were forgotten. 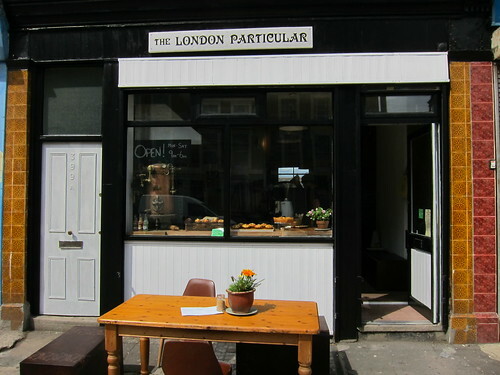 The London Particular is exactly what the area needs, a nice little place that people can chill out in, eat nice food, drink good coffee. The surrounding area is a bit of a wasteland and other than the Venue (never go there), has no discernible landmarks or real points of interest. It's still early days so hopefully the issues I encountered will be ironed out but I wish it well and is definitely worth a visit if you ever find yourself in New Cross. @lizzie - Both have impeccable taste, innit. I am currently browsing London blogs for what I can't eat and miss the most and this is basically it. Bacon (well the cheese is new but looks good). I really like New Cross and glad to see there will be even more stuff when I come back.